Is spending long hours at the spa and beauty parlor draining your money? If so, here is a solution for you. Try out some of the home made face packs given below. These are cheap and do not make a hole in your pocket. At the same time, they are very effective and much better than the parlor treatments. For home made face packs you need not go anywhere but your kitchen. It has all the ingredients that can maintain your health and beauty. Some of the ingredients are very nutritious and you will get instant results. One of the best ingredients that you can use form your kitchen is the egg. It is used by the majority of the people for breakfast. It is full of nutrition needed for your body. In addition to its health benefits, it is also excellent for your skin. 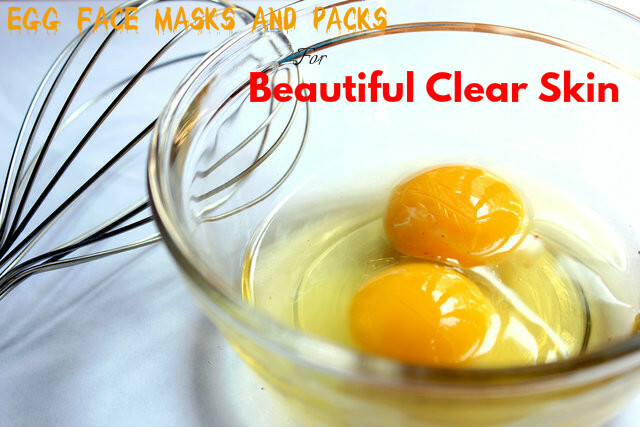 You can make various face packs and face masks with eggs. These help in enhancing the texture of your skin and also reduce wrinkles and fine lines on the skin. Cleanse your face well with a good cleanser. Take an egg and separate the yolk and the white. Now dip a cotton ball in egg white and apply this on your face. Let it remain on your face for 10 to 15 minutes, till it dries completely. This face mask improves the blood circulation in your face and thus provides you a healthy and radiant skin. It is also excellent for tightening your skin. Take the yolk of an egg in a small bowl. Mix 1 teaspoon of honey to the egg yolk and blend well. Apply this on your face after you clean your face. Let it stay on your face for 10 to 15 minutes. Wash well with plain water. This face pack is perfect for keeping your skin well moisturized and to prevent dry skin conditions. Take the white part of egg. Mix this well with multani mitti (fuller’s earth). Blend them well till you get a face pack with a good consistency. Apply this mixture on your face and wait for 15 to 20 minutes, so that it gets dry. Wash your face to remove all traces of the face pack. Using this pack regularly helps in reducing the secretion of oil on the skin and thus prevents the breakout of acne and pimples. It is also good for preventing various other problems of oily skin. Take the white portion of the egg in a small bowl. Take a small carrot and grate it. Add the grated carrots and some milk to egg white. Cleanse you face and apply this pack on your face. Wait for 15 to 20 minutes so that the face pack gets dry. Now wash your face thoroughly. This face pack is one of the best anti aging remedies. It is suitable for all skin types. Use this face pack regularly and prevent the appearance of wrinkles and fine lines on your face. It also makes your skin firm by maintaining the elasticity of the skin. Take some gram flour in a small bowl. Mix it well with the white of the egg. Add a few drops of fresh lemon juice to this mixture. Mix all the ingredients well to get a smooth paste. Apply this pack evenly on your face. Wait for about 20 minutes. By this time the pack will become dry. Now wash your face thoroughly with plain water. This face pack will remove excess oil from your skin and keeps your face fresh and glowing. Cleanse you face. Take the white of the egg and apply it directly on your face using a brush or by dipping a cotton ball in it. Leave it on your skin for about 10 to 15 minutes, till it gets completely dry. By applying this regularly on your face, you will see a significant reduction in fine lines and wrinkles on your face and it keeps your skin firm and tight. So, this pack is excellent for making you look young. Take an egg in a bowl and whisk well. Add some oatmeal to it and mix properly. Wait for 10 to 15 minutes till it becomes dry. Wash your face thoroughly with plain water. This is an excellent face pack for oily skin and keeps your face oil free and fresh. This is a great face pack for dry skin. It helps in keeping your skin well moisturized and supple. Take the yolk of an egg in a small bow. Mix 2 spoons of olive oil to the egg yolk. You can also add some lemon juice if you want to lighten your skin tone. Apply the pack on your face and wait for about 15 minutes. This pack can be applied for thinning hair as well. It helps to stop hair fall, smoothen hair and retain hair growth. So, eggs are essential for a healthy body as well as a healthy skin, providing you a flawless glowing skin.